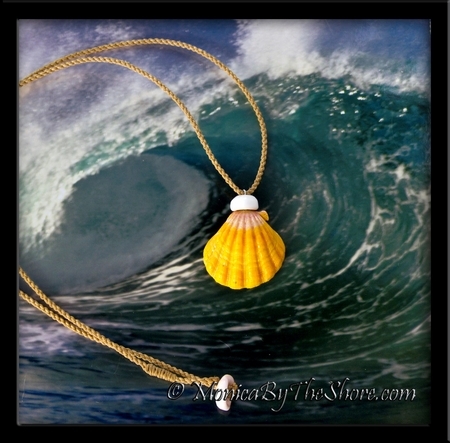 Big Country giant size Hawaiian Sunrise Shell on twisted cord necklace! Nothing says North Shore more than Sunrise Shells and Puka Shells! 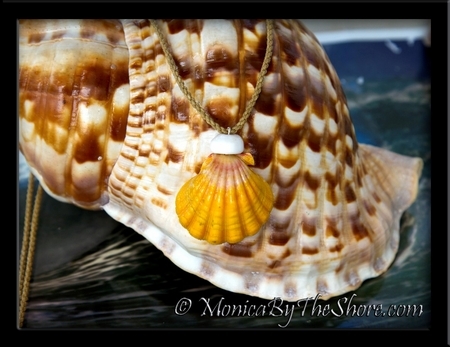 This extra large bright yellow with pink and white Hawaiian Sunrise Shell is topped off with a North Shore Puka Shell that adds the final "County touch" to the Sunrise Shell pendant which drapes on a natural colored twisted waxed cord 26 inch necklace which can easily be shortened to any length, and has a Puka Shell and loop closure. This beautiful Sunrise Shell is jumbo sized slightly over 1 1/4 inches of pure North Shore Aloha! And don't be afraid to wear it in the ocean, these shells love the surf! An original MonicaByTheShore design, simple, natural beach seashell jewelry from Oahu, Hawaii. Hand crafted with Aloha, one piece at a time, in Haleiwa and Honolulu, Hawaii.